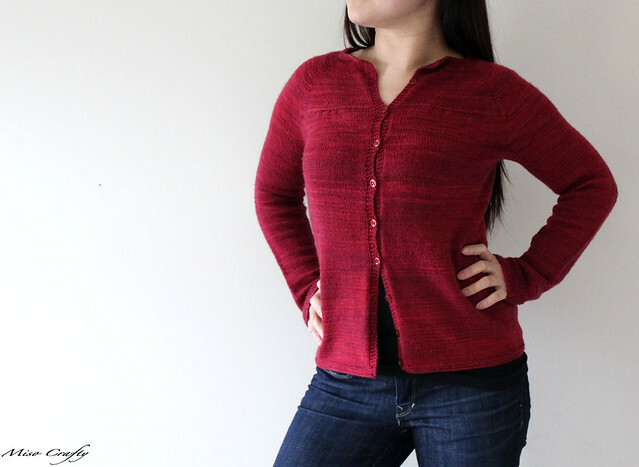 O...M...G. That's right peoples, I'm finally blogging about my Georgia cardigan!! This project is so beyond long overdue for its debut, it needs its mad props pronto! What took me so darn long to finally show you guys my Georgia? So yes. 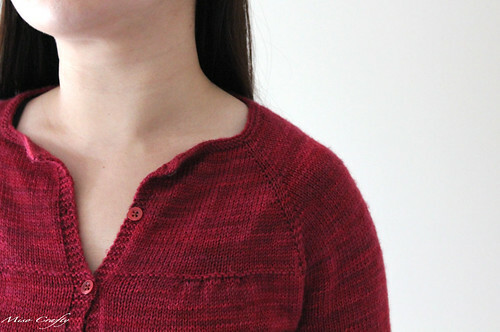 Buttons are to blame for why it took me forever and a year to blog about this project! Seriously! This cardigan was started in February, finished in August, blocked in September, and now buttons added in November...oy vey! But don't think I don't have any love for this cardi. Oh, hells no! The second this was dry from blocking you better believe that I was wearing this practically every day. This cardigan is sooo comfy and absolutely perfect in keeping the chill out. For a while there it really didn't matter that there was no buttons on this bad boy, but then Brett asked the other day if I was ever going to add the buttons. I guess that was a hint? I finally buckled down and went to the local big box sewing store and managed to snag the last 2 cards of buttons that matched! Score! Now that I've added the buttons this cardigan has become my ultimate go-to cardi - I grab it when I need to throw something on when I leave the house, when the house is feeling a little chilly it's the perfect sweater to put on and still look/feel chic, and most importantly, it works amazingly well with the rest of my wardrobe as I pretty much wear nothing but jeans, a tank or tee with a cardigan thrown on top. I'm seriously contemplating knitting a few more in different colours! Yes, I'm one of those people who, when they find something they like or works they get it in every single colour possible. Once I got over my gauge issues (which we won't get into...it was exhausting. But if you're that curious, that post is here) the knitting went along swimmingly. Although, don't pay attention to the insides where I either joined new yarn or tried to alternate skeins...yeah, not pretty. I've knit quite a few sweaters since and have learned from my mistakes. The pattern, in case you didn't know, is Georgia by the über talented Jane Richmond. I absolutely love Jane's patterns. They are so well-written and in a simple format so that when you look at the pattern you don't feel intimidated and overwhelmed. I hate that feeling you get when you look at a pattern and see pages and pages of nothing but notes, numbers, and complication instructions on how to do something that should be simple. Not with Jane's patterns though! When you look at her patterns you get the immediate feeling that you can totally pull it off without a hitch (and in my case, think you can whip it up in a matter of days...which I suppose could be true, if you didn't eat, sleep, or have to take care of a rambunctious toddler). Another thing that I love about Jane's patterns - the fact that she admits/notes that she uses up every single inch of the yarn, including the swatch. Not many, if any, designers admit that they swatch and then rip it up so that they don't waste the yarn. Ahhh...a knitter after my own heart! Thank you Jane for being honest and for realizing that there are a ton of knitters out there that do that exact thing! I didn't do any modifications, I even kept the sleeve length as written in the pattern! I love three-quarter length but decided to not go that route this time around. 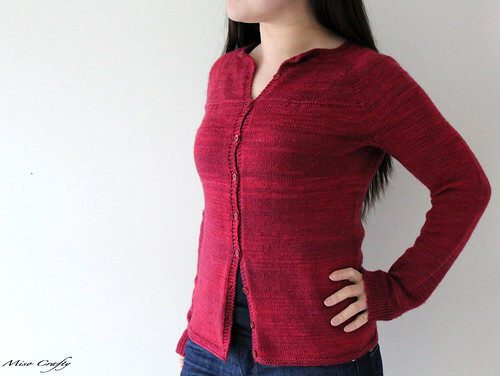 I really wanted this cardigan to be a year round piece and knew that if I wanted to wear this in the dead of winter that it would have to have long sleeves. In hindsight I could've gone just a tad bit shorter since I have abnormal T-Rex arms. I should also point out that I had knit the 36" bust size. I didn't want the cardi too snug and the actual 36" would have been too big, but because of the gauge that I was getting I knew I would get something around the 34" range with enough room in the waist for when I'm having a blah day. Oh! Can I also talk about the yarn? Ooohhh...the yarn! This was my first time knitting with SweetGeorgia's Cashluxe Fine (yum...MCN!) and it will definitely not be my last!!! Knitting with this yarn was so heavenly. Physically and visually! It was so lusciously, squishy soft sliding through my fingers and the colour...oh my, the colour is absolutely delicious! I'm going to sound like a total geek, but I got a weird, giddy, happy-joy every time I got to a bright and vibrant pink-y section of yarn and would be full of glee after knitting it. I get compliments whenever I wear this and had gotten compliments every time I've knit this cardigan in public. 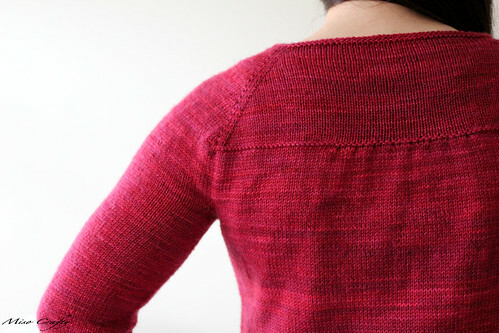 Ok, I think I just talked myself into knitting another Georgia...and I know I have some more Cashluxe Fine in the stash. But I also have some beautiful purple (Boysenberry) Tough Love Sock that would also make a fabulous Georgia. Although, one of the newest colours in the SweetGeorgia lineup, Glacier, would also make for a gorgeous Georgia...oh, and the turquoise-y blue of Saltwater? Oh yeah, that would be one smoking hot Georgia! I can go on forever here. Please excuse me, I need to go smell some yarn. Thanks Rebecca!! :) I soooo want to knit another but am thinking maybe I should knit an Audrey first before making another Georgia. Just so that I can knock one more "to-knit" off my list! Thank you for all of your kind words about my patterns Melissa, you really did just make my day. What a fabulous job you've done - the sweater is amazing! Funny/sad reading about your button woes! Is that little button shop no longer there in Victoria? I remember coming across it once, before I had really started knitting. There's one in Vancouver that's supposed to be amazing too! The ones you chose look great. Love how you used the Sweet Georgia for your Georgia sweater - how fitting!